We are at the cutting edge of the future of healthcare. By harnessing the huge potential of collaboration between the NHS, industry, health science organisations and researchers, we discover, develop and adopt the medical breakthroughs of the future. Under the umbrella of Barts Life Sciences, our mission is to inspire, invent, trial and accelerate the commercialisation and adoption of novel pathways, products and services to improve health for all. Based in east London, we provide access to expertise and resources at the one of the largest NHS Trusts in the UK, with the global gene pool on our doorstep. Life sciences combines research, innovation and technologies to transform health and care services. It is the space where research, health and industry come together to spark new ideas and innovations in a powerful creative cycle. By bringing together healthcare professionals, patients and their families, innovators, industrialists, researchers and others, improvements can be made to patient care and the performance of health and care services. uses the commercial potential of medical techniques and treatments, creating local jobs and generating wealth that is invested back into further scientific research. 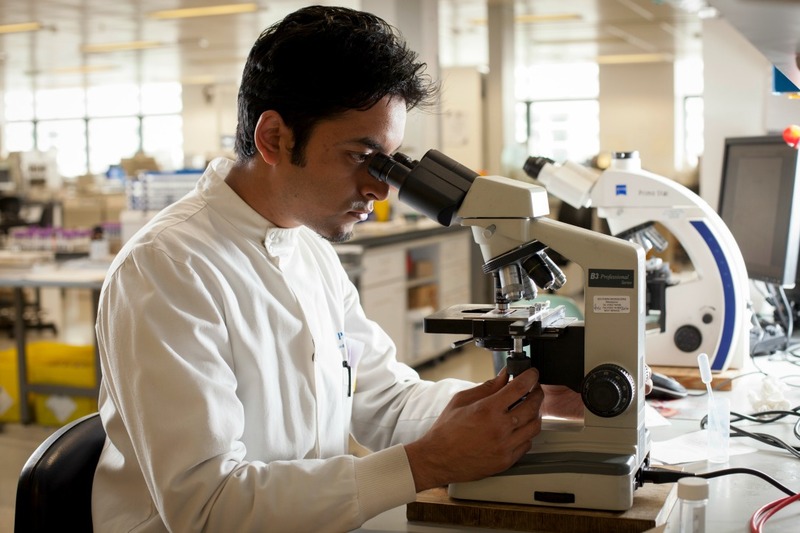 Barts Health is home to three national biobanks and our Bioresource at St Bartholomew’s Hospital is one of the fastest growing medical research programmes. We host 21 separate research repositories containing over 500,000 human tissue samples, each linked to a pseudonymised patient record. They include three national cancer biobanks for male, breast and pancreatic tissue. We want to integrate, expand and open up these resources to researchers looking to develop new ways of monitoring, diagnosing and treating health conditions. We are a leader in global firsts and ground-breaking trials and have over 32,000 patients actively involved in research programmes. We have an army of clinicians eager to find new drugs, treatments and therapies to spearhead the coming revolution in personalised medicine. We have ongoing collaborations with global Med Tech, pharmaceutical and early-stage companies to improve clinical pathways and reduce costs. In 2017/18, Barts Health topped the table for supporting the most life sciences studies. Our aim is to commercialise access to all these life sciences resources and provide an infrastructure to support the invention, adoption and diffusion of medical innovation. In order to build on the significant life sciences work already undertaken at Barts Health, we plan to create a thriving life sciences centre at the heart of a vibrant cluster which will sit next door to The Royal London Hospital. In July 2018, the Department of Health and Social Care bought underused land from Barts Health to kick-start the development of this cutting-edge research campus. The plan is to develop several plots of land left over following the development of the new Royal London Hospital into one of the most modern research facilities in Europe. This land covers a ground area equivalent to two-and-a-half football pitches. The new development will create up to 11,500 full-time jobs and will be a powerful incentive for attracting new start-ups and other innovative and dynamic enterprises. Revenue will be reinvested back into local healthcare, securing clinical and financial sustainability. Find out more about how our life sciences campus has been backed by government investment. Experience and skills in data analytics, health and care records management, information governance, and consent management. ICT infrastructure to facilitate research and innovation. NIHR is launching a new, single-stage, open competition to designate and fund NIHR Applied Research Collaborations (NIHR ARCs). The new ARC funding and support is for applied health and care research and to support the implementation of research into practice, making tangible improvements for patients, the public and to health and care services.